Sag plus Sag makes a dynamic duo. Sun in Sagittarius will be buoyed by Moon in Sag’s need for more, while Moon in Sag will feel that her need for expansion is satisfied by her Sun partner. These two will do nothing halfway, but grounding influences would be helpful to keep this relationship from becoming an extravagance that never settles into stability. Sun in Sagittarius sees the same things as everyone else, he just views them with more optimism. Everything has possibility in his eyes, and nothing should be taken too seriously. His partner will certainly appreciate his positive approach, although his difficulty with moderation and focus will be an issue. 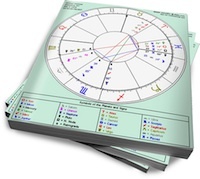 Sun in Sag makes a generous, enthusiastic partner, always ready to explore new ideas. But he’s not fond of delving too deeply into those ideas (especially if something even newer catches his eye). Moon in Sagittarius needs adventure in her relationship. A partner who keeps things fresh, and who isn’t concerned with establishing a rigid domestic routine, will suit her best. Moon in Sagittarius will keep her partner afloat with her positive feelings, as long as he doesn’t insist on intensive exploration of unpleasant issues. She’ll view this as “wallowing” and would rather avoid or move on from depressing subjects. These two will feed each other’s fires. The Sun partner will be urged on to bigger and better extravagancies by his Moon partner’s need for more. The Moon partner will feel right at home with her Sun partner’s approach to life. The downside to all this fire is the potential for the relationship to never fully manifest. These two may be so busy exploring distant horizons that they don’t allow their union to take root in the present. Some grounding Earth planets (in at least one of their charts) can be helpful to give their fire a vessel, which will allow the flame to last longer. My husband’s sun is Sag and my moon is Sag. I feel the exact situation in this article. What can we do? Fires between us never stop.